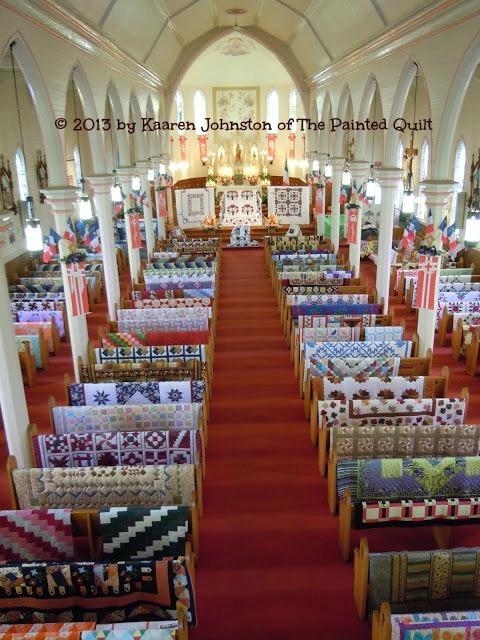 Well, it's that time of year again when the Guilde Acadienne de Clare hosts the most wonderful five day quilt show and sale in a venue that will take your breath away. 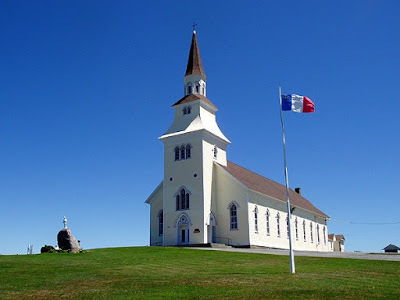 This year's event will take place from Monday, July 27th to Friday, July 31st at the L'Eglise Sacre Coeur in Saulnierville, Nova Scotia. The hours are from 10:00 a.m. to 8:00 p.m. except for Friday when it will close at 4:00 p.m. If you're looking for a locally made quilt or are a quilter who just happens to be in the Maritimes on vacation, come on down! I promise you that it is worth the drive and you won't be disappointed. To find out a little more about the area history and show, just click HERE. I've been told that the instructions on the layout page for Step 2 of my Mystery Quilt-Along are really tiny and difficult to read so I've typed them out and created a new PDF document with the instructions only. Just click HERE for the link to the new typed instructions. Once again, my apologies. A computer guru I'm NOT!!! Did you all finish with Step 1? If you didn't, no worries because if you remember my words when we got started just last week, "It's not a race!" The links to the files will always be available for you to access here on my blog. From your overwhelming response both here and on Facebook, I going to guess that there are probably over 500 people sewing along. Kinda cool, huh? 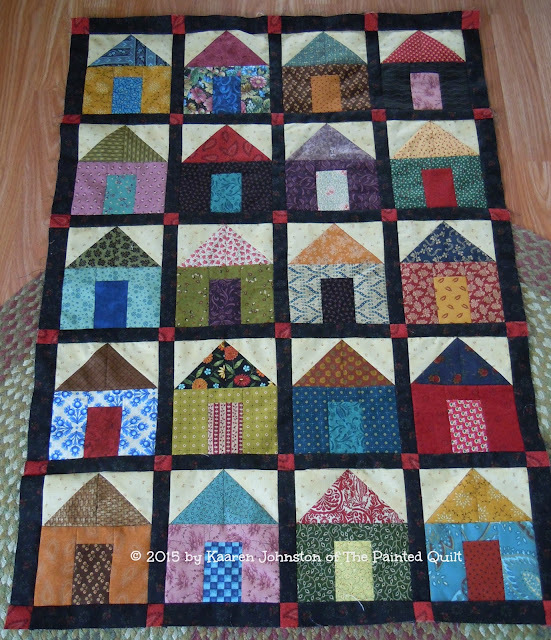 Here is my quilt top with both Steps 1 and 2 complete. I know that many of you have been waiting patiently for Step 2 so just click HERE to download the PDF file containing the photo, layout and instructions. Step 3 to follow in a couple of weeks so stay tuned! From all your comments, emails and PM's, it looks like we're going to have one heck of a ginormous, virtual quilt-along party!!! Are you ready to start Step 1 of the Mystery Quilt-Along? Okay ladies...and gents are welcome too...start your engines machines because I'm ready if you are but just a word before we start. Please let me say that this is NOT a race and there are NO deadlines. Nor will there be a checkered flag at the end. If you don't finish each step before I give you the next one, it's NO BIG DEAL!!! You will be able to access the files for all the steps here on my blog for as long as I keep blogging and believe me, I have no intention of stopping any time soon! Just to let you know, I did make one change to the original layout. I removed one row after realizing that if I left it at five rows, it would have resulted in a disproportionate quilt that it would have been too narrow for the length. I like it much better this way and I'm sure I'll find some use for the fifth row. I might even incorporate it as part of the backing. To access the PDF file which includes the instructions, layout and photo, please click HERE. We'll see you next week with Step 2...if I get it finished on time. Remember, there's not going to be any strict schedule. Let's just HAVE FUN!!! Okay, here's the deal...but humor me first by allowing me give you a bit of the background which got me here. If you remember...and if you don't, that's okay too...when a couple of months ago I was asked to design a line of fabrics? I was taken completely by surprise and was in 'shock and awe' mode for about a week. To make a long story short, I was given about six weeks in which to complete everything from start to finish. I have always worked best when under pressure and this adventure proved that I haven't lost it since retiring in 2006. I made the deadline with time to spare and to be honest with you, it took the wind right out of my sails once it was done. The great news is that Blank Quilting loves it which was another burden lifted from my shoulders because there's always an element of self doubt when you're under contract and designing for someone else. After all the work was done and everything was sent off to New York city, I kinda lost my mojo. I was designed out and really didn't feel like starting into anything new. Yes, there was an attempt at starting Leanne Beasley's Journey of a Quilter but I soon realized that the fabric I had chosen from my stash just wasn't me and quickly put it aside. As a matter of fact, that same fabric is now living in Washington state with a friend because I knew that it would just languish and collect dust in my stash cupboard(s). I made a few 'smalls', two pincushions that I shared with you both here and on Facebook. I thoroughly enjoyed designing and making them because I am not a happy camper when my hands are idle. Still, no desire to start a new quilting project. 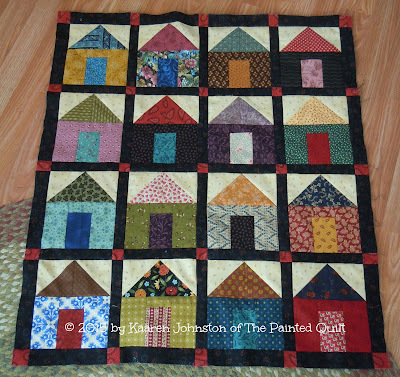 But I always have my sketch book handy and the other night while I was doodling at the kitchen table where I do all of my handwork, I came up with an easy peasy house block. 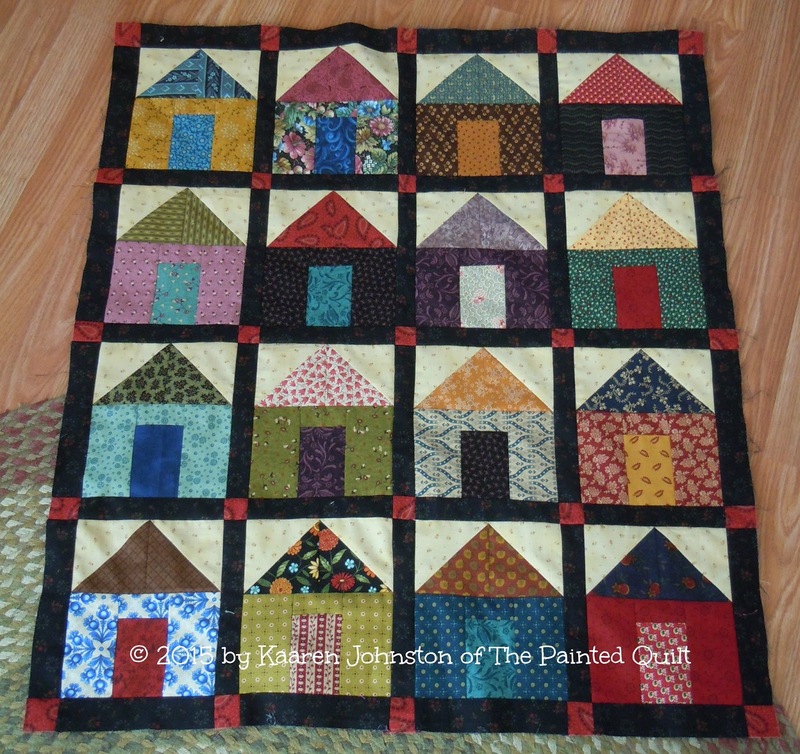 Now who doesn't LOVE house blocks? 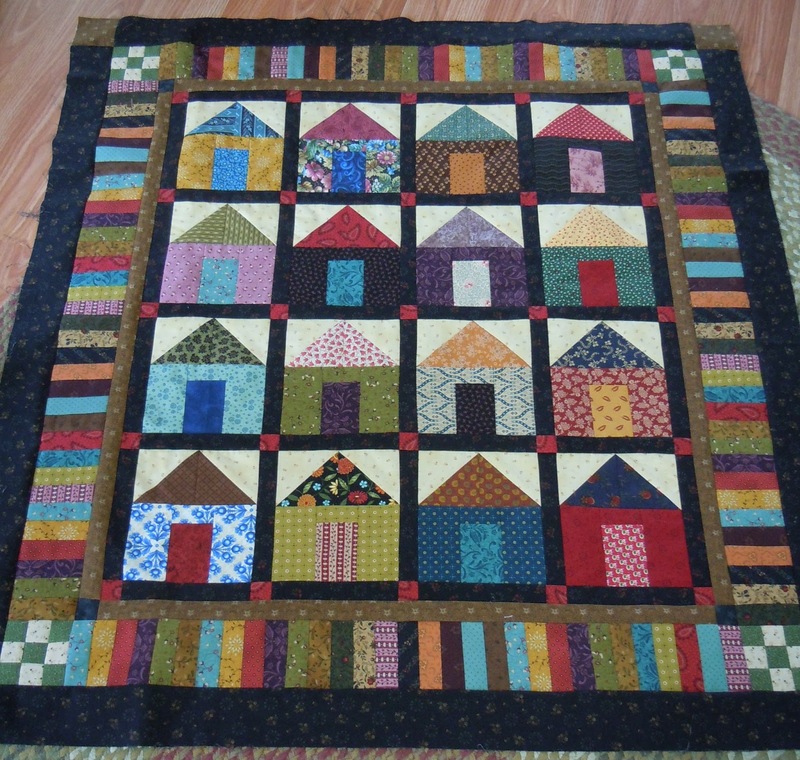 In my last post, I spoke about starting a new project which at the time was going to be a mini quilt. I didn't want to commit myself to anything larger for fear that my mojo would run away again. Can you spot the little house block there, right beside my sketch book, the one with the red roof, aqua door and black sides? I made that as my prototype to see if the measurements worked and if it was going to work for what I had in mind. And to the extent that I think I got my mojo back because I'm not going to stop there! So would you like to make your own along with me? For lack of a better term, we'll call it my 'Mystery Quilt-Along'. At least once a week I'll post the next step with photos and measurements. I'm not going to "teach" you how to make this quilt because as you'll see, it won't be difficult to make. And of course there'll always be the option to either email or PM me if you have a question. It is my intention to make this a queen size quilt and of course you can stop at any time if you reach the size that suits you. This is definitely going to be a great stash buster because that's all I'm going to use. As a matter of fact, all I've used so far are off cuts and left overs from previous projects. The scrappier and more colorful the better is my motto! Just leave me a short comment or even a 'yes' or 'no' so I can get an idea of how many will be playing along. Oh, and there will probably be a giveaway in the next little while and the winner will be chosen at random from the comments left on this post. You'll be happy you did!!! So spread the word because it's always more fun when we have lots of company. Frankie has given his approval and says, "Welcome on board!" So come on back this Tuesday the 14th when I'll be posting the information to get you started. In the mean time, round up all your scraps and get ready to have some fun! I am! And I'm even happier that my mojo is back!!! 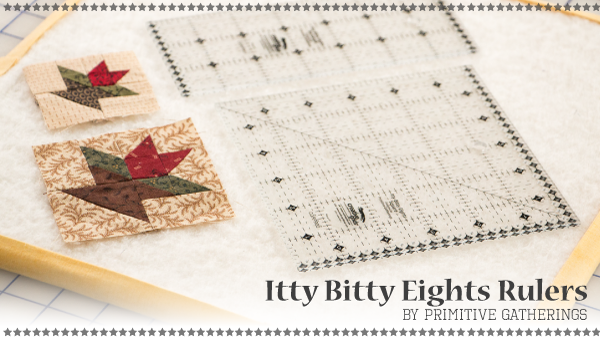 I just finished cutting out the pieces for a new scrappy mini quilt that I recently designed. Give me a couple of days to get 'r done and I'll happily share it with you along with the pattern and instructions. 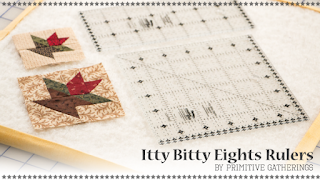 Something that made the cutting process a breeze were the Itty Bitty Eights Rulers by Creative Grid designed by Lisa Bongean of Primitive Gatherings. You certainly don't need them to cut out this quilt but I just had to share my excitement about them. This was the first time I used my rulers and I can assure you, it won't be my last. They're my new fave must-have quilting tools! On the home front and in anticipation of winter which will be here before we know it, our first of many loads of fire wood was delivered today. before taking a much needed rest. They both made the executive decision that the rest will just have to wait until tomorrow!